Note-taking apps for the iPhone are hardly scarce, with many third-party options available for a device that ships with a stock Notes app fully integrated into it’s own cloud-based sync services. While Squarespace is best known as a blogging platform, the company recently pushed out a note-taking app of their own, Squarespace Note. Squarespace Note is a minimalist note-taking app that syncs your textual memos with a variety of services including Squarespace itself, Evernote and Dropbox. It’s advertised not as an independent note-taking app, but rather a proxy for your other subscribed services. When you first install Squarespace Note, a short tutorial plays explaining and demonstrating the gesture-based navigation that the app uses for storing and editing your notes. Once that’s over, you’re thrown right into a new note that you can begin typing (or, of course, dictating through iOS’s native dictation tools). There’s nothing else to notes aside from text. You can’t attach photos, video or any other type of media which could have been a nice feature, albeit one that may have ended up causing compatibility issues with the variety of services the app works with. Nevertheless, with some rival apps supporting media embedding, Squarespace Note instantly becomes a less-favourable choice for some users. Squarespace Note features a very minimalist design, dedicating screen real estate to the content itself. As mentioned before, Squarespace Note uses gestures to navigate. 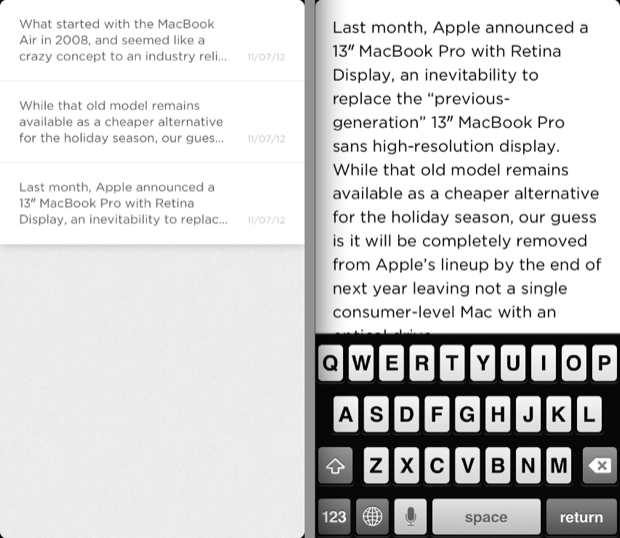 Choosing services in which to sync your content requires a swipe to the right; sending a new note after it’s written needs a swipe upwards; and a swipe to the left shows you a list of all the notes previously sent. It takes a while to get used to — especially when your note is longer than what can be seen on the display at once — but is a generally better alternative than some cluttered, heavy UI, especially at this screen size. Squarespace advertised their Note app not as an independent service, but rather one that works with other established services by sending your content off there. These services include Squarespace themselves, Dropbox, Evernote, generic email and popular social networks, specifically Twitter and Facebook. The latter social networks are conveniently authenticated if you’re already logged into them iOS wide and other services can be logged into as well if you have their app installed. Squarespace Note posts to a number of popular services. Users can send to multiple services at once, meaning the app can actually act as a fantastic social media tool, allowing users to send to both Twitter and Facebook simultaneously. In fact, the way Squarespace Note handles sending longer notes to Twitter by default is great, splitting your message up into consecutive tweets, numbering each one out of the total sent for that note. Once services are connected, there’s a few options available to be modified, altering the way your note is sent. For example, users can toggle whether to attach a location to tweets and opt to prefix emails sent with a specific message. 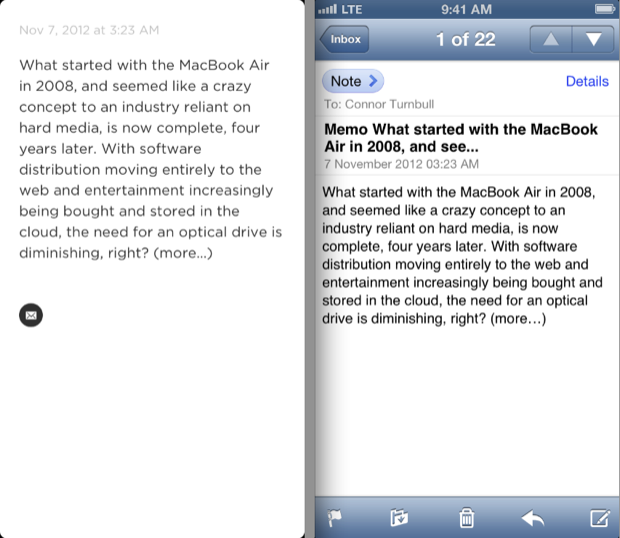 On the right, an email received as a result of sending a note through the app. Squarespace Note is very minimalist, resembling apps like iA Writer with an interface that rarely features anything but text on a white background. Therefore, everything about the app is concentrated on your note’s content. By not being cluttered with a heavy user interface, the app instead opts for gestures as a navigational tool. Squarespace opts for a clean, minimalist design dedicated to maximising the screen real estate available for your content. The app looks great on the Retina display, with text being very crisp as is expected from a combination of a text-only app and such a high-resolution display that the last three generations of iPhone have featured. Squarespace Note is a useful app and a viable alternative to the stock Notes app that comes preinstalled on your iPhone. The key to this app is that it’s not simply a notetaking app, but rather a “passthrough” application that works as a client for a range of other services. If you’re looking for a client as which to use with one of these services, Squarespace Note might just be the one. It’s also a great tool for posting to social media. Squarespace Note not only boasts a simpler setup than much Twitter and Facebook apps but it combines that with an elegant way of handling longer posts. For the price of free, it’s hard not to recommend Squarespace Note. However, with your iPhone already shipping with an equally as good Notes app, it’s difficult to see why you’d opt for this one, other than the integration with services like Evernote and Squarespace.